Create a custom contact resistance probe to allow scientists to test resistance of various materials in different configurations over a wide range of uses. Use off-the-shelf and custom components from National Instruments, Tecnova Electronics, and other vendors to create a one-of-a-kind contact resistance probe solution. Common electrical connectors are generally taken for granted, although the amount of research into the technology and physics is surprising. Small differentiators between connector manufacturing companies mean the difference between being an innovative leader or a follower in the market space. A leading manufacturer of connectors used in a wide range of applications from automotive to medical approached Tecnova to modernize their proprietary contact resistance probe system. This system was 15 years old, relying on measurement and control equipment that had been surpassed in accuracy and capability, and test results stored on magnetic tape. Early test data has begun to deteriorate. The underlying task pf the effort was to make the new system "as precise as modern technology could make it". Tecnova used off-the-shelf tools, such as LabVIEW, PC DAQ cards, Microsoft Access, cameras, and microscopes as well as custom-designed stepper moto drivers built by Tecnova Electronics (contract manufacturing division of Tecnova). The result is a system that is highly accurate and repeatable. Vibration at the table holding the unit under test is near zero. Connector samples can be moved in precise, infinitesimally small increments at imperceptible speeds along four axes (X,Y,Z, and rotation). 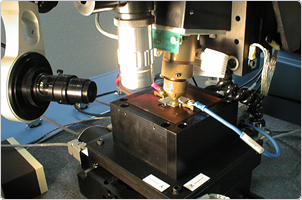 Microscope cameras with 800X magnification allow researchers to position samples accurately with measured data points superimposed on the video image. Microscope views can be recorded, cataloged, and played back. An Access database captures results, analyzed data and graphs. CD burners replace the out-of-date magnetic tape drives and allow research scientists to archive test data in a modern format. Create a low-cost, handheld battery powered fluorometer for use in laboratory settings to measure trace chemicals in industrial reverse osmosis treatment systems. A custom designed pen fluorometer with a membrane keypad and LCD display, based on the Texas Instruments MSP430F427 16‑bit ultra-low-power microcontroller. Industrial reverse osmosis (RO) water treatment is used to purify process water by removing impurities. As pressurized raw water enters the RO system, a small amount of pure water passes through a filter membrane. Develop a low-cost, robust, and lightweight solution for medium-duty steel cutting needs for light-duty construction and do-it-yourself (DIY) applications. A custom circuit board based on the Microchip PIC16F870 processor monitors status and controls power and cooling to the plasma torch. Plasma cutting of sheet and plate steel offers several advantages over other means. Sawing or grinding material produces metal chips.